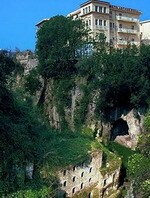 Sorrento is a small city in Campania, southern Italy, with some 16,500 inhabitants. It is a popular tourist destination. The town can be reached easily from Naples and Pompeii, as it lies at the south-eastern end of the Circumvesuviana rail line. The town overlooks the bay of Naples, as the key place of the Sorrentine Peninsula, and many viewpoints in the city allow sight of Naples itself (visible across the bay), Vesuvius and the island of Capri. The Amalfi Drive (connecting Sorrento and Amalfi) is the narrow road that threads around the high cliffs above the Tyrrhenian Sea. Ferry boats and hydrofoils provide services to Naples, Amalfi, Positano, Capri and Ischia. Sorrento's sea cliffs and luxury hotels have attracted famous personalities, including Enrico Caruso and Luciano Pavarotti. The Hotel Antiche Mura is an Art Nouveau building with elegant marble interiors situated in the main square of Sorrento with views over the Valley of the Mills. The Belle Époque breakfast room serves a buffet breakfast in decorative surroundings with Art Nouveau flooring, Murano glass, and a wrought iron grapevine. Guests can take a dip in the outdoor pool which is set in lush gardens bordered with citrus trees, statues, and a section of the 15th century city walls; a selection of drinks and snacks are served at the poolside bar. The elegant lounge bar is decorated in warm colours with majestic columns, while the solarium becomes a romantic candlelit terrace by night where guests can enjoy aperitifs. The traditional 19th-century Grand Hotel Royal is located in Sorrento, Italy, within 13 kilometres of Capri across the Bay of Naples. The hotel is 20 kilometres from Pompeii. Set in mature gardens on a cliff top, the Grand Hotel Royal is a large property, rebuilt in the 1980s. 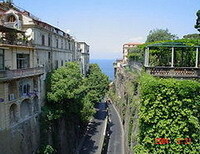 It is painted in pastel shades with balconies taking in the views of the Bay of Naples. The hotel offers guests complimentary buffet breakfast. Classic Le Relais restaurant has regional specialities and international dishes for breakfast, lunch and dinner. During the summer months guests can dine alfresco on the terrace. The informal poolside Snack Barbecue bar has a menu of light snacks. There is a second snack bar by the sea terrace. The bar serves drinks and cocktails on the garden terrace. There is an outdoor pool and spa tub area at the Grand Hotel Royal. Watersports, from sailing to scuba diving, are available nearby. A lift goes down from the hotel to the private sea terrace. Offering panoramic views of the bay of Naples, the Hilton Sorrento Palace is located 500 meters from the historic center of Sorrento. Guests can swim in the six outdoor pools before topping up their tans on the pool terrace or enjoy a refreshing drink from the poolside Pagoda bar. Fitness enthusiasts can work out on cardiovascular and weight machines in the gym, practise their serve on the floodlit tennis court or swim lengths in the indoor pool. Younger guests will be kept entertained by the Kids' Club, which provides supervised pool activities from 15 June to 15 September. For dining, the Sorrento Restaurant offers an impressive atmosphere, including a woven bronze chimneypiece above the fireplace that defines the room. Drinks and light food are featured there. 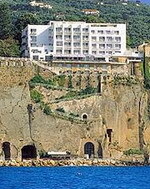 The hotel Parco dei Principi is located on a cliff-top overlooking the Bay of Naples in Sorrento, 50 kilometers from Naples and with easy access to the island Capri. The restaurant, which features patterned and pictorial majolica tiling exclusive to the region, offers an international and Neapolitan fusion of cuisines. The hotel has three rooms that can be used for conferences and social gatherings and audio-visual facilities are also available. Guests can unwind in the outdoor swimming pool or can descend the cliff to take advantage of the hotel's private beach. Around Sorrento, visitors might want to visit the Museo Coreale di Terranova set in an 18th century palace and featuring some of the rich artwork of the region including mosaics, archeological collections and paintings. Visitors may also want to experience the dormant volcano at Mount Vesuvius, renowned for its destruction of the city of Pompei in ancient times. The Hotel Villa di Sorrento is located in Sorrento, Italy, 20 minutes by hydrofoil from the island of Capri and 20 kilometres from Pompeii. Distance to Circumvesuviana train station is 350 metres, and ferries depart 400 metres away. 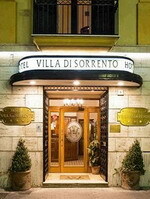 Opened in 1854, the four- storey Hotel Villa di Sorrento was among the first hotels in the city. Amenities include a hotel bar, a town car service, and currency exchange. Safe-deposit boxes are found at the 24-hour front desk where multilingual staff can assist with travel and tourist arrangements. Parking (surcharge) is also available, and discounted rates are offered at a nearby fitness centre. A complimentary continental buffet breakfast is served each morning in the bright atmosphere of the hotel's breakfast room. Room service is also provided. A variety of water sports is offered at nearby beaches, and bicycles and scooters can be hired nearby. Taormina is a comune and small town on the east coast of the island of Sicily, Italy, in the Province of Messina, about midway between Messina and Catania. Taormina has been a very popular tourist destination since the 19th century. It has popular beaches (accessible via an aerial tramway) on the Ionian sea, which is remarkably warm and has a high salt content. Taormina can be reached via highways (autostrade) from Messina from the north and Catania from the south. Offering utmost comfort and impeccable service, this charming property provides an atmosphere of being at home, while away from home. Situated in front of the sea, Baia Delle Sirene Hotel is 600 metres from the Taormina Exit and 60 kilometres from the Catania's Fontanarossa Airport. The Syracuse, Palermo, Agrigento, Monreale, Etna as well as the Acolian Islands are the major attractions in Sicily. The hotel offers comfortable guestrooms that are tastefully decorated and come with an array of modern amenities to make your stay a pleasant one. Guests can relish delicious cuisine in an elegant setting of the on-site restaurant. After a tiring day, you can unwind at the cosy bar with a refreshing drink. 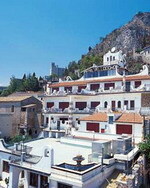 The modern Grand Hotel San Pietro Relais & Châteaux is located in Taormina, Italy, within 800 metres of the Old Town. 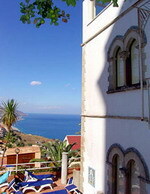 The nearest railway station is Giardini Naxos. 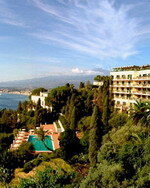 The 6-storey Grand Hotel San Pietro is on a hillside overlooking the sea, and has views of Isolabella Bay and Mount Etna. Complimentary buffet breakfast is available at the hotel. From the large windows of the Il Giardini delgi Ulivi restaurant, the view looks across the terrace to the sea. Light lunches can be enjoyed under the olive trees or, inside, there is an a la carte daily menu of regional and international dishes accompanied by a wide range of Sicilian wines. An intimate place for drinks, La Melarancia is dressed in richly coloured fabrics, sofas and windows that also open onto the terrace. The hotel has an outdoor pool, and a beauty corner provides various treatments. Guests can use the hotel's library. Various watersports are on offer at the beach, including windsurfing, scuba diving and jet skiing. 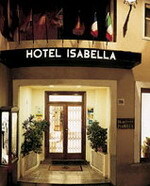 Hotel Isabella is adjacent to the Corso Umberto boutique shopping center in the Sicilian island of Taormina, Italy. The ancient Palazzo Corvaia palace is 50 meters from the hotel and the Greek Theatre is 100 meters away. The seaside town of Giardini is within four kilometers. Complimentary breakfasts are served from the restaurant's historic Roman terrace overlooking the bay of Naxos and Mont Etna. Guests at Hotel Isabella are provided access to a health club and private beach at a nearby facility. A shuttle providing access to Hotel Isabella and water recreation facilities is provided daily. 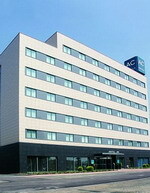 A tennis club is located 300 meters from this hotel. Guestrooms at Hotel Isabella boast town views from private balconies. Desks and minibars are included. Cable television is provided in each room. Hotel Splendid is located in Taormina, Italy, within 200 metres of the city's historic centre, the main pedestrianised street and Corso Umberto shopping area. The beaches of Mazzaro Isola Bella are three kilometres away. Giardini Naxos - Taormina station is 4 kilometres away. Set overlooking the bay of Letoianni and Calabria's coastline, this hotel was originally an ancient monastery and offers gardens and terraces. An outdoor pool is open during the summer amid a suspended garden overlooking the Ionic coast to Messina. Hotel Splendid serves a complimentary continental breakfast each day for guests. There is a snack bar that opens during the day next to the pool. A piano bar serves cocktails in the lounge. There is a large roof terrace with sea views. A Mediterranean garden dotted with ancient Roman-style artefacts surrounds the hotel. Massage and babysitting services are available. The multilingual concierge can arrange trips and tours. Offering maximum comfort, this property is an ideal place for a peaceful and tranquil stay. 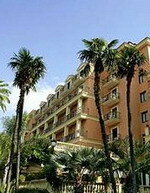 Situated in the heart of Taormina, the Vello D'Oro Hotel is close to the historical centre and Palazzo dei Congressi. The hotel is also near to the pedestrian area and the famous Piazzetta Sant'Agostino, which consists of numerous shops, cafes as well as restaurant. The hotel boasts 53 comfortable guestrooms that are well-equipped with an array of modern amenities. Some of the rooms feature a panoramic balcony, which either have a front view or a side view. You can dine at the on-site restaurant that serves a delicious buffet breakfast as well as traditional Italian cuisine and later have a refreshing drink in the bar. Trento is an Italian city located in the Adige River valley in Trentino-Alto Adige/Südtirol. 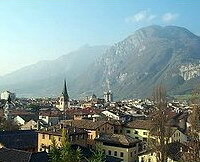 It is the capital of the region and of the Autonomous Province of Trento. In the English-speaking world, the city is most notable as the location of the Council of Trent. Trento is a major educational, scientific, financial and political centre in Trentino Alto-Adige and Northern Italy in general. The University of Trento ranks highly (9th) out of Italy's top 30 colleges, and amongst the 500 best in the world, coming 407th. The city contains a picturesque Medieval and Renaissance historic centre, with ancient buildings such as Trento Cathedral and the Castello del Buonconsiglio. Modern-day Trento is a cosmopolitan city, with highly-developed and organized modern social services. The city often ranks extremely highly out of all 103 Italian cities for quality of life, standard of living, and business and job opportunities, coming 1st, 6th and 2nd respectively. Trento is also one of the nation's wealthiest and most prosperous, with its province being one of the richest in Italy, with a GDP per capita of €29,500 and a GDP (nominal) of €14.878 billion. The Grand Hotel Is Located In Trento, Italy, 15 kilometres from Monte Bondone, 31 kilometres from Pergine Lake and 55 kilometres from Verona. 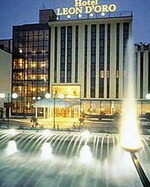 The Hotel features a restaurant which serves a complimentary breakfast daily, massage rooms and sauna and secure parking. Guestrooms have air conditioning, satellite television and pay movies and wireless internet (surcharge). Treviso is a city and comune in Veneto, northern Italy. It is the capital of the province of Treviso and the municipality has 82,206 inhabitants (2008): some 3,000 live within the Venetian walls (le Mura) or in the historical and monumental center, some 80,000 live in the urban center proper, while the city hinterland has a population of approximately 170,000. The city is home to the headquarters of clothing retailer Benetton, appliance maker DeLonghi, sports eyewear maker Rudy Project and bicycle maker Pinarello. The Late Romanesque-Early Gothic church of San Francesco, built by the Franciscan community in 1231–1270. Used by Napoleonic troops as a stable, it was reopened in 1928. The interior has a single nave with five chapels. On the left wall is a Romanesque-Byzantine fresco portraying St. Christopher (later 13th century). The Grand Chapel has a painting of the Four Evangelists, by a pupil of Tommaso da Modena, to whom is instead directly attributed a fresco of Madonna with Child and Seven Saints (1350) in the first left chapel. The successive chapel has instead a fresco with Madonna and Four Saints from 1351 by one Master from Feltre. The church, among the others, houses the tombs of Pietro Alighieri, son of Dante, and Francesca Petrarca, daughter of the poet Francesco. 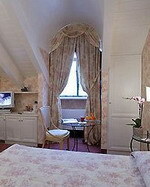 The Maggior Consiglio, A Boscolo First Class Hotel is located along a picturesque winding street in Treviso, Italy. It is in the town of Treviso that the Terraglio, the road that leads to Venice, begins. The Treviso train station is positioned 1 kilometre from the hotel. The elegant Tazio restaurant prepares pizzas and exquisitely presented Venetian dishes. On-site bars offer a selection of Italian wines and cocktails. A dedicated elevator serves the Maggior Consiglio Hall that accommodates up to 500 people. High-speed Internet access is available in public areas of the hotel, and a business center offers fax and photocopy services. Isola Wellness Spa contains Technogym equipment and offers Pilates, Pancafit and Poweryoga classes. A healthy, chlorine-free indoor pool is positioned near a massage waterfall and a bubble massage bench. Spa enhancements include a thermarium, which combines the benefits of a sauna and a Turkish bath. Cold mists, tropical rain treatments, hydromassage and Kneipp courses add to the roster of spa therapies. Charming antique Venetian home set in a private park 12 km from Treviso and 19 km from Venice. Comprising 30 rooms, each of which of has been given the best of modern equipment, such as air-conditioning, digital phone lines, modem ports, satellite TV, mini bar and for the safety of clients, the best fire alarm system. Set in its own private park of 3 hectares, in the near future with a swimming pool and tennis courts, and immersed in the context of the agricultural firm that surrounds it, owned and run by the same family. Turin is a major city as well as a business and cultural centre in northern Italy, capital of the Piedmont region, located mainly on the left bank of the Po River surrounded by the Alpine arch. Turin is a flourishing, industrious and cosmopolitan European city, which enjoys state-of-the-art technology and architectural developments. The city boasts a rich culture and history, and is known for its numerous art galleries, restaurants, churches, palaces, operahouses, piazzas, parks, gardens, theatres, libraries, museums and other venues. 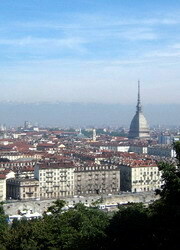 Turin is well-known for its baroque, rococo and neo-classical French-style architecture. Much of the city's public squares, castles, gardens and elegant "palazzi" (such as Palazzo Madama), were built by Sicilian architect Filippo Juvarra, who modeled these buildings on the classical French architecture of Versailles. Examples of these French-themed edifices include the Royal Palace of Turin, the Palazzina di caccia of Stupinigi and the Basilica di Superga. Turin is sometimes called the "cradle of Italian liberty", due to it being the birthplace and home of notable politicians and people who contributed to the Risorgimento, such as Cavour. The city currently hosts some of Italy's best universities, colleges, academies, lycea and gymnasia, such as the Polytechnic University of Turin. Prestigious and important museums, such as the Museo Egizio and the Mole Antonelliana are also found in the city. Turin is well known as the home of the Shroud of Turin, the football teams Juventus F.C. and Torino F.C., the headquarters of automobile manufacturers Fiat, Lancia and Alfa Romeo, and as host of the 2006 Winter Olympics. Several International Space Station modules, such as Harmony and Columbus, were also manufactured in Turin. 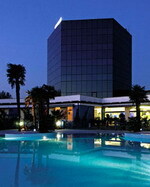 The Mercure Torino Crystal Palace is located in Turin, Italy, three kilometres away from the Cinema Museum. The Teatro Reggio and the Palazzo Reale are both two kilometres away from the hotel. This hotel provides wireless Internet in the property's public areas and offers a dry cleaning service. Mercure Torino Crystal Palace offers drinks and snacks in the Chocolart Bar, which has an American theme. The 67 guestrooms come with wireless Internet and televisions with satellite channels and pay movies. The rooms also include climate control, telephones, safes, and minibars. The private bathrooms come with hair dryers. 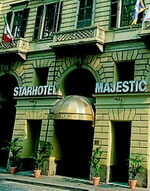 The Starhotels Majestic in Torino is a first class hotel that lies in the heart of the city, a short walk from the historic center and situated 27 kilometers from Caselle Sandro Pertini Airport. 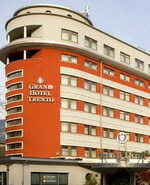 Just opposite the Porta Nuova station, the hotel is easily accessible to most attractions in Torino. Attractions convenient to the hotel include the Modern and Contemporary Art Gallery, Egizio Museum, Palazzo Reale, and Andrea Maugeri. With its 19th-century furniture, fine fabrics and period chandeliers, the Starhotels Majestic offers the modern traveler with the same warm atmosphere of the late 1800s. The Starhotels Majestic, Torino even during a recent renovation has maintained the refinement the charm of yesteryear and added on to its decor and the elegance of its rooms. For a relaxing break, you can sip a cocktail in the in-house bar the "Il Circolo". Savor genuine Italian cuisine in the Le Regine Restaurant. Verona is a city in Veneto, northern Italy, one of the seven provincial capitals in the region. It is one of the main tourist destinations in north-eastern Italy, thanks to its artistic heritage, several annual fairs, shows and operas, such as the lyrical season in the Arena, the ancient amphitheatre built by the Romans. 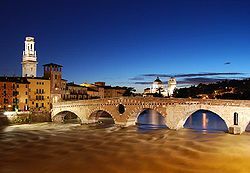 Verona owes its historical and economical importance to its geographical location, in a loop of the Adige River near Lake Garda. Because of this position, the areas saw regular floodings until 1956, when the Mori-Torbole tunnel was constructed, providing 500 cubic meters of discharge from the Adige river to Lake Garda when there was danger of flooding. The tunnel reduced the risk of flooding from once every seventy years to once every two centuries. 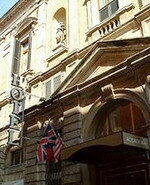 The Hotel Accademia is located in Verona, Italy, within 200 metres of Juliet's Balcony, and Piazza Erbe. Verona Porta Nuova train station is 1.5 kilometres away. Situated on the lively shopping avenue, Via Mazzini, this city hotel features an art nouveau lobby with a red and gold carpeted stairwell, stone pillars, and art works. A library, restaurant, and parking garage with valet parking for registered guests are on site. A complimentary buffet breakfast that includes gluten-free selections is offered daily. Local, seasonal dishes and seafood specialities are offered at the romantic Academia restaurant, with its traditional decor of flock wallpapered walls, rose- coloured curtains, chandeliers, and ornate mirrors. The hotel offers a Welcome drink from 1 p.m. to 5 p.m. Swimming, tennis, yoga, and a driving range golf course can be found nearby the hotel. Bicycle rentals are offered nearby. 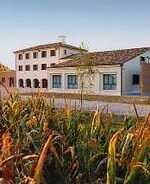 Hotel Antares is a large, stylish, modern property featuring a marble lobby, 10 kilometres from historic Verona and 24 kilometres from Mantua. The hotel's Quatro Elemento Restaurant is decorated in neutral shades with earth tones and dark linens, and serves international cuisine with local specialties. It features a wood-burning pizza oven and an outdoor patio terrace, while the Zeffiro Café is a stylish, modern lobby bar, with a terrace and pool view, serving a selection of drinks and wines, as well as quick snacks. Guests can also swim in the large outdoor pool and children's pool fringed by palm trees, and relax on the sun terrace with loungers. Business services are available, including translation services and audio- visual equipment, and other practical amenities include a 24-hour front desk, free parking and free airport transfers if pre-arranged. The hotel is well placed for exploring the surrounding area and its sights. The hotel is conveniently situated for transfer to and from Verona International Airport (Valerio Catullo), which is located just 12 kilometers from the city center and can be reached by the APT bus, which departs every 20 minutes for Verona Central Station. The hotel is located only 15 minutes' walking distance from the historical town center of Verona and from the main shopping area (Via Mazzini / Via Cappello). All major points of interest and landmarks in Verona are within easy reach of the hotel, and the Via Roma, Via Mazzini, Via Cappello, Via Leoni and Corso Porta Borsari are all exclusively pedestrian precincts. Verona offers many places of historical and architectural interest, from classical Roman, High Medieval, the city-state or free commune, Renaissance and baroque periods. Vicenza, a city in northern Italy, is the capital of the eponymous province in the Veneto region, at the northern base of the Monte Berico, straddling the Bacchiglione. Vicenza is approximately 60 km west of Venice and 200 km east of Milan. Vicenza is a thriving and cosmopolitan city, with a rich history and culture, and many museums, art galleries, piazzas, villas, churches and elegant, Renaissance palazzi. The Palladian Villas of the Veneto, in the surrounding area, and the renowned Teatro Olimpico (Olympic Theatre) have both been enlisted as UNESCO World Heritage Sites since 1994. 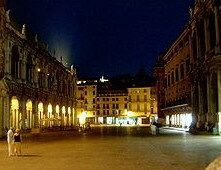 As of December 2008, Vicenza had an estimated population of c. 115,000. 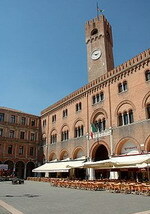 Vicenza is the third-largest Italian industrial centre as measured by the value of its exports, and is one of the country's wealthiest cities, especially due to the engineering/computer components industry (Federico Faggin, the silicon chip's inventor was born in Vicenza). Also, about one third of the country's gold and jewelry industry is made in Vicenza, greatly contributing to the city's economy. 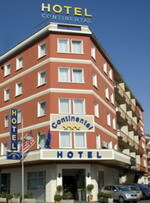 The contemporary Hotel AC Vicenza is located four kilometres from Vicenza train station and the piazza. Verona Airport (VRN) is 25 kilometres from the hotel, with an approximate driving time of 30 minutes. The hotel's modern fitness centre is equipped with state of the art exercise machines, a turkish bath, and showers. Guests enjoy complimentary coffee and newspapers in the lobby lounge and sunny afternoons can be spent relaxing on the terrace. 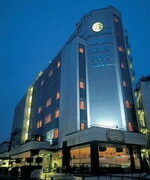 The hotel also offers a business centre with fully equipped modern meeting rooms and secretarial services. 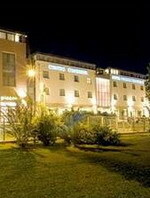 The Hotel AC Vicenza's contemporary restaurant offers a modern Italian menu with an emphasis on fresh local ingredients. Complimentary breakfast is offered daily. The Piazza dei Signori and Basilica are four kilometres away, and travellers can take a day trip to see the numerous sights of Venice, 50 kilometres away. Blending classic elegance, utmost comfort and friendly service, this property is an ideal place for business as well as leisure travellers. 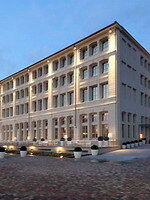 Situated in the historical centre of Vicenza, the De La Ville Boscolo Hotel is just a kilometre from the Vicenza Train Station and 59 kilometres from the Verona Airport. The hotel offers 118 comfortable guestrooms that are beautifully appointed and come with an array of modern amenities to make your stay a memorable one. The on-site Tazio Restaurant and Wine Bar serves Italian cuisine and a rich selection of wines for you to feast on.. Located in a residential area, the Hotel Continental is less than a kilometre from Vicenza's historic centre with its ancient theatre. The 55 individually decorated guestrooms are contemporary in style, and include air conditioning, direct-dial phones, complimentary wireless Internet, satellite television, and complimentary toiletries. In fine weather, guests can recline on sun loungers in the leafy roof garden. Cyclists have the use of a secure bike store with a workshop for repairs, while those arriving by car benefit from free use of the hotel's car park. Multilingual staff at the 24-hour front desk can advise on local sightseeing opportunities and there is an Internet point where guests can plan their own itineraries. The Villa Rotunda is one kilometre from the hotel and the cities of Venice and Verona are both within 50 kilometres. Verona Airport is 50 kilometres from the hotel with an approximate driving time of 45 minutes.